Yesterday evening(September 20th) Gabrielle Union and Sanaa Lathan posed together on the red carpet for the Netflix premiere of 'Nappily Ever After' at Harmony Gold in LA. 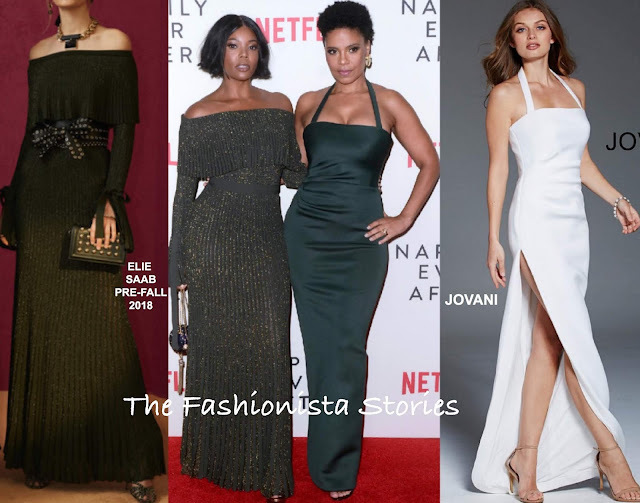 Gabrielle Union looked great in a ELIE SAAB PRE-FALL 2018 thorn green lurex, off-the-shoulder maxi dress which she teamed with purple round bag and CASADEI sandals. A center part short bob and minimal makeup finished up her look. Sanaa Lathan also opted for a green dress, courtesy of JOVANI. Her halter column, floor gazing dress, featuring a side split. The dress is available in several colors but she looks great in this green. Minimal make-up, her natural short hair and gold earrings finished up her look.